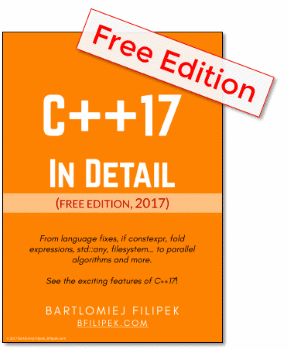 Another year is almost over so it is a good time to check what is going on with C++. This time more stats and real data compared to my post from the previous year. This chart provides a general view on C++11 conformance. Percentage comes from counting implemented features in a given compiler according to the list of 45 C++11 language features. Please note that the view may be a bit imperfect or unfair. One language feature can have more "value"/importance than some other. For instance "extern template" vs "constxpr". Or "long long" vs "delegating constructors". This would require to put partial factors for each feature. Additionally some features have several versions (like move or lambda) - only the latest version should be counted. I used wiki.apache.org/stdcxx as a base for my work. I've upgraded it and cleaned up a bit. Additionally compilers: HP, EDGE, IBM, Sun/Oracle, C++ Builder (front-end is based on Clang 3.1 now) and Digital Mars were removed. Version 12.1 of MSVC means - November CTP, but this is not "official" of course. Included more features implemented in VS Nov CTP. BTW: C++14 draft specification is already implemented by Clang 3.4. I did not included any of C++14 features here. I will come back to this topic later.